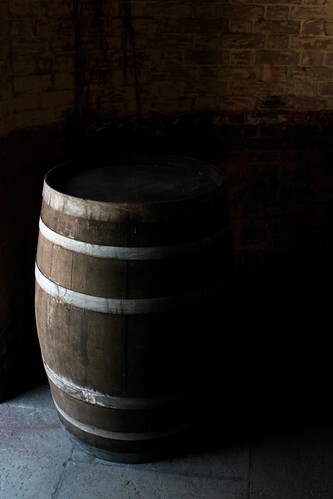 But much to her own surprise, Marjina found herself turning back and moving to the next barrel. Trembling, and with unsteady hands, she untied the leather strap roped over the wooden barrel cover and peeked underneath it. She saw the tiny holes immediately and understood their significance. Sensing more light seeping through the holes in the cover, another male voice whispered from inside this drum, "Is it time?" "Not just yet," she whispered back once again, in their leader's voice. One by one, she walked to all the other barrels untying their leather straps and peeking underneath. One by one, their occupants sensed the motion and asked their question. "Not just yet," she chanted back at them in response, until she came a full circle to the last drum almost at the front of all others in the alcove. It stood beside the first barrel she had bumped into. No voices whispered from its hidden womb when she untied its leather strap. No holes were visible on its top cover. She softly kicked its heavy bottom to be sure. There were no protests in reply. With her heart almost in her mouth with fear, and with almost no strength or will, she unwound its wooden cover. Dark wet oil stared back at her from its open belly. Like an automaton, she walked back to the kitchen fire, lost in thought. She sat down in front of the fireplace, thinking frantically, seeking answers to tens of questions. The broth was boiling, almost done. She stared at it. An idea began to form in her mind. She would have to work fast. And silently. There was no time to lose. "What's she thinking, Pa?" Josh asked excitedly, able to bear the tension no more. "What do you think she's thinking?" Rosh asked him back, pausing the Arabian Nights tale. "She's going to throw the boiling broth on them," Josh jabbered. "There's not enough in a pot to kill 37 of them," Isha responded. "She'll be foolish to try that." "She could boil more water," Josh pushed on. "In her biggest pot. And then pour it on them all." "She can't do it in one go," Isha objected. "It's not as if she was filling their cups with tea from a kettle. She'll need at least a pot full for each of them, and have to do it one by one." "Even if she averages a minute," Rosh explained, "for a round-trip between the fire and the barrels, carrying enough boiling water each time to do the job in one go, and pours it on all of them one by one, without spilling any of it on herself, it will still take her at least half an hour to deal with them all." "Even assuming that she managed to kill a few of them instantly, at least one of them would howl in agony when this boiling hot water hits them. Then she'll lose her advantage. The element of surprise would be gone. Game over. For Team Alibaba." "She should surround the wooden barrels with brushwood and logs," proposed Isha, "and set fire to them simultaneously. Burn the lot of them together." "And burn the house down with them too?" Josh retorted. "They'll not just keep sitting there quietly inside their barrels, after smelling the smoke and feeling the heat. No, there's got to be another way. And it's got to be fast, furious and final - all in one hit." "Old Iranian houses weren't made of wood," Rosh clarified. "They were made of mud bricks. Kashan's masterpieces, like many older houses made in other parts of Iran, were made of humble, local, earth. So, she won't burn down the house if she did that." "In many older cities throughout Iran, stucco was the most widespread method of ornamentation in Persian houses. One reason was the relatively cheap price of materials used, like gypsum for example, that didn't require a high temperature to be transformed into plaster." "This was an important consideration while choosing building materials in places like central Iran, where wood was relatively scarce..."
"If wood was that scarce," Josh interrupted, "that people couldn't use it as a building material for their houses, then there wouldn't have been enough wood stored in their house either, to burn 37 men completely. Even one cremation takes a lot of wood." "Well, Qasim was a rich man," Isha argued weakly. "If he had an alcove in the kitchen big enough to store 38 oil barrels in neat rows on the ground, then maybe he had enough wood stored in the house too. Also, the barrels were wooden. That should help." "Even if there was enough wood stored in the house," Josh immediately changed track, "how long would it take her to get all that wood, then go around 38 barrels, place all that wood and then light 38 fires all at the same time to burn them all together? Not less than half an hour!" "Plus, the smoke and heat would warn them long before the fire actually reached them. She needs to wake up the others. Together, they can quickly boil and pour the boiling water on them all." "Waking up people takes time too," Isha insisted, "if you've got to do it quietly, and one-by-one. Do you know how long it takes me to wake you up? Then she'll have to explain everything to everyone." "Which could lead to panic. All it takes is one, to raise the alarm, no matter which side they are from. Once the alarm was raised, even the stupidest of thieves would wonder what was going on and try and break out of their hiding place to check it out or escape."